Music notation reading encapsulates auditory, visual, and motor information in a highly organized manner and therefore provides a useful model for studying multisensory phenomena. Paraskevopoulos et al. show that large-scale functional brain networks underpinning audiovisual integration are organized differently in musicians and nonmusicians. They examine brain responses to congruent (sound played corresponding to musical notation) and incongruent (sound played different from notation) stimuli. Multisensory integration engages distributed cortical areas and is thought to emerge from their dynamic interplay. Nevertheless, large-scale cortical networks underpinning audiovisual perception have remained undiscovered. The present study uses magnetoencephalography and a methodological approach to perform whole-brain connectivity analysis and reveals, for the first time to our knowledge, the cortical network related to multisensory perception. The long-term training-related reorganization of this network was investigated by comparing musicians to nonmusicians. 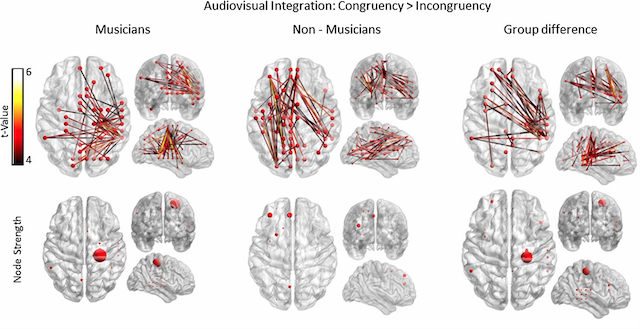 Results indicate that nonmusicians rely on processing visual clues for the integration of audiovisual information, whereas musicians use a denser cortical network that relies mostly on the corresponding auditory information. These data provide strong evidence that cortical connectivity is reorganized due to expertise in a relevant cognitive domain, indicating training-related neuroplasticity. Figure - Paradigm of an audiovisual congruent and incongruent trial. (A) A congruent trial. (B) An incongruent trial. The line “time” represents the duration of the presentation of the auditory and visual part of the stimulus. The last picture of each trial represents the intertrial stimulus in which subjects had to answer if the trial was congruent or incongruent. Figure - Cortical network underpinning audiovisual integration. (Upper) Statistical parametric maps of the significant networks for the congruent > incongruent comparison. Networks presented are significant at P less than 0.001, FDR corrected. The color scale indicates t values. (Lower) Node strength of the significant networks for each comparison. Strength is represented by node size.